Behind the Lens: We busted on Huron Peak! We busted on Huron Peak! 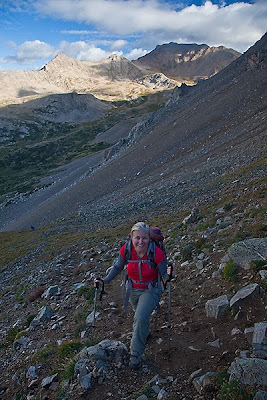 As described in my previous blog, the Mount Harvard climb went well. 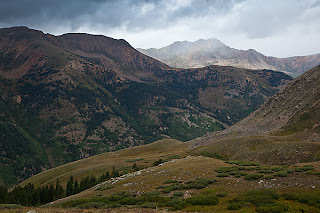 The next morning we awoke before dawn to gale winds but decided to go for Mt. Columbia anyway. Wind was better than lightning any day. Steve and Ed were tired and decided to relax in camp while three of us did the climb. 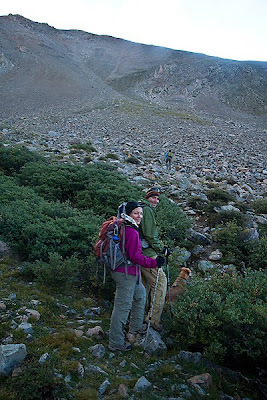 Rick, Jen, and I headed out at dawn. I, of course, took photos as we went. 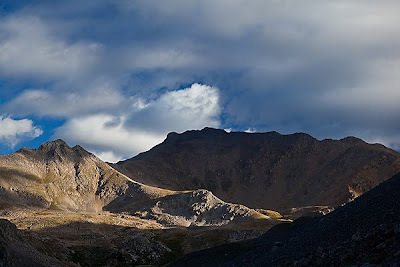 Within a quarter mile, the "trail" headed straight up the mountain in loose scree above timberline. Foot by foot, we scrambled higher, puffing in the thin air. Mt. Harvard loomed above us to the north. Just because the air was thin, however, didn't mean that the wind didn't flail away at us. 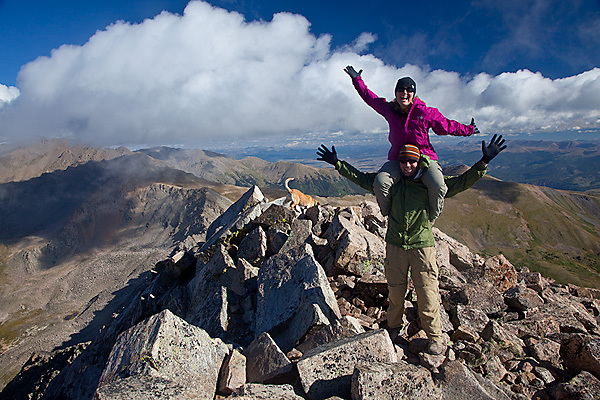 We finally reached the crest of the south summit ridge at roughly 13,500 feet. 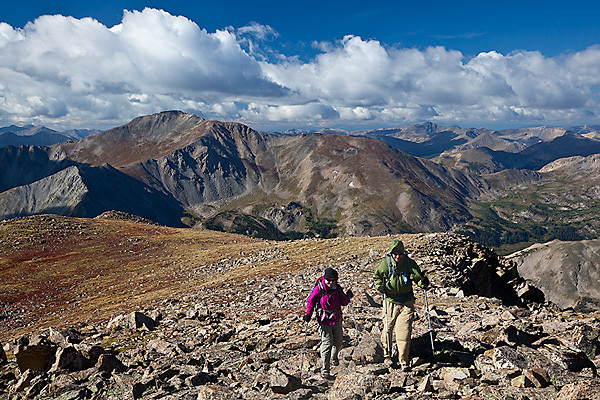 The trail improved and the grade lessened as we headed north toward the summit. 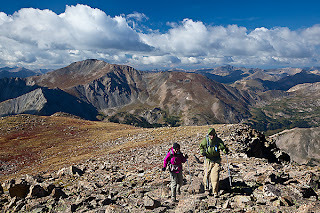 Soon we were there, at the top of 14,073-foot Mt. Columbia. As always, the view was spectacular, making the hard climb worthwhile. We took pictures and huddled up behind some rocks out of the wind to wolf down some snacks and water. 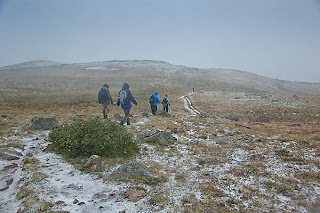 We quickly got chilled, so down we went, slipping and sliding our way back to base camp. 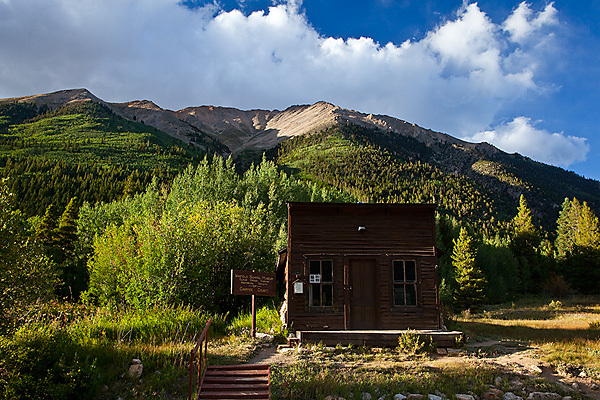 Once at camp, we tore down our tents, packed up our gear, and hiked out to the trailhead, all downhill blessedly. In Buena Vista we rewarded ourselves with beer and pizza. Jen, Rick, and Ed headed back to Colorado Springs, while Steve and I drove partway up to the Huron Peak trailhead to camp for the night along Clear Creek. We'd had two successful ascents in two days. What could go wrong with a third? That evening Steve and I photographed the ghost town of Winfield in beautiful golden light. During the night it rained off and on, raising questions about the next morning's climb. We slept in a bit later than normal because of the rain. We ate breakfast as golden light burned through the clouds, raising our spirits. Soon enough we drove the short way up the bad 4WD road to the trailhead and started hiking. Dark clouds were already starting to form again, putting a damper on our enthusiasm. Regardless, onward we went, trudging up the trail as it switchbacked higher and higher through the spruce and fir trees. The sun tried to come out once, but slowly faded in the steel-gray skies. The wind started to rise as the clouds darkened to the west. 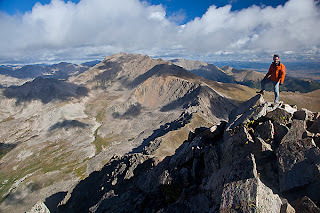 At about 12,500 feet, well above timberline, Steve and I huddled up behind a boulder to try to get out of the wind. 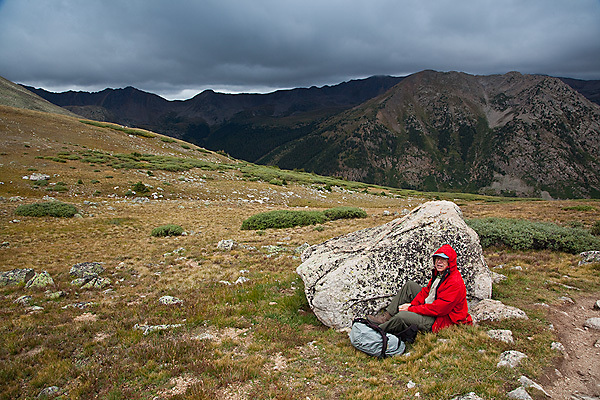 The sky was rapidly becoming gloomier and the temperature was falling, so Steve decided to bail out and head down. 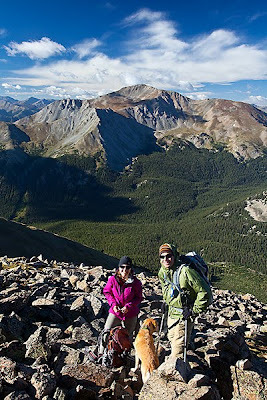 I, being the crazy one, continued higher, hiking with a couple that had caught up with us. 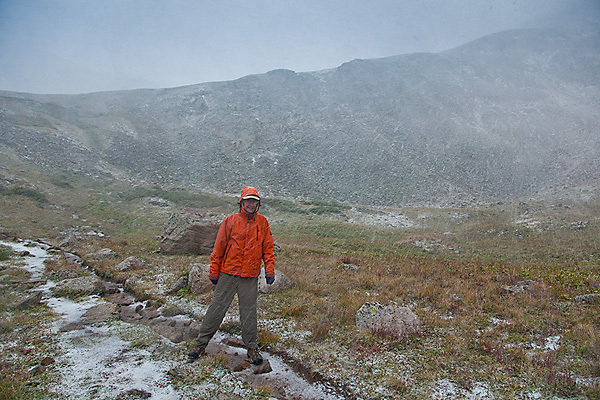 Soon the first bits of sleet began to pelt down, bouncing off our jackets. Surely it wouldn't last long and at least there wasn't any lightning, we told each other. 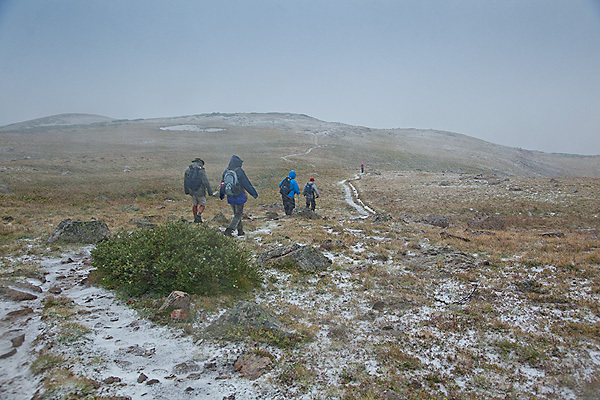 We were completely exposed to the gale on the steep tundra slopes. Soon the sleet turned into a full-fledged snow storm. "Should we keep going?" we kept asking each other. Even with Gore-tex, we were getting pretty wet and cold from the windblown snow. Visibility was down to a few hundred yards. We were lost in a gray world of tundra and snow. Finally we decided to turn around, although the decision was frustrating so close to the summit. But it was the right one. Minutes later the first lightning bolt hit. Lightning in a blizzard in August. How fun. Our already rapid pace accelerated. We were hunched over, unable to even look in the direction we were walking. The wind-driven snow and sleet stung our faces, making it painful to look up. 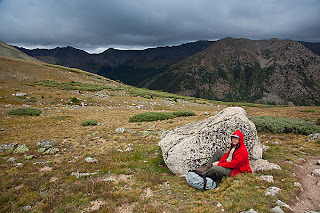 Finally we reached timberline and relaxed a little, with a little more protection from the lightning. 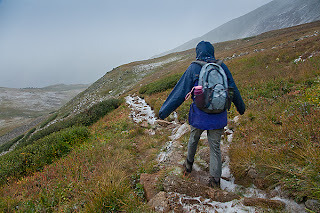 As we descended, the air warmed enough that the falling snow turned to rain. We sloshed our way down the mountain, getting to the bottom just as the sun burned through. 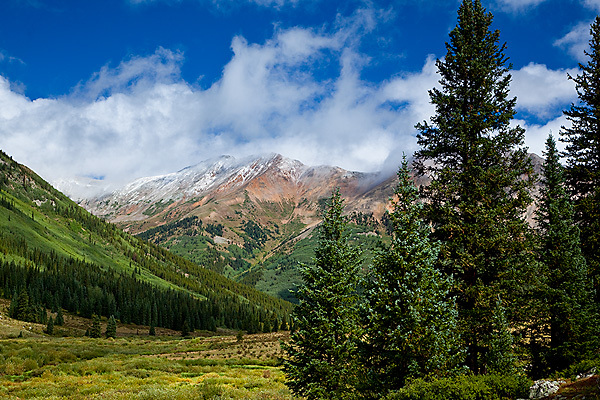 The clouds lifted off the snow-covered peaks above and a beautiful day began. And we were back at the bottom of the mountain. Well, the mountain would be there next year. Steve and I packed up and headed back to northern New Mexico for the night and then home the next day. The score? Steve and Laurence: 2, Mountains: 1. Love it! Glad the lightning didn't score in the end, too.